Potentially life-saving equipment will be handed out to Scots at risk of contracting a disease on the hills, the Scottish Government has confirmed. 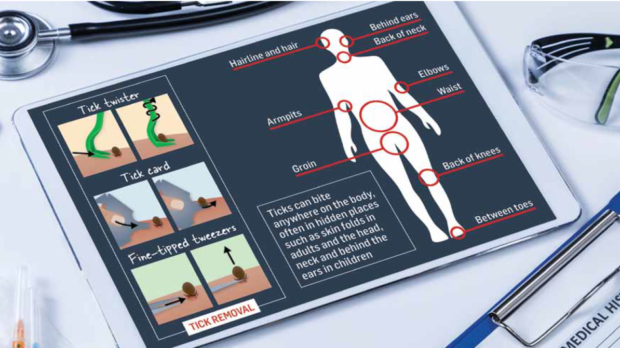 In a battle against Lyme disease, a condition caused by an insect bite from a tick often caught by people walking in the hill or countryside, simple credit card-size tick removers will be handed out to residents and tourists. With up to 3,000 cases of Lyme disease recorded each year it is hoped walkers will become more vigilant in removing the parasites after trips outside. The “danger area” in Scotland for ticks is throughout Aberdeen, Aberdeenshire, Highlands and Islands, Argyll and Bute, the Western Isles and Moray. Smaller numbers of cases are reported in Orkney, Shetland and Caithness and Sutherland. But Aberdeenshire West MSP Alexander Burnett previously described the Scottish response to the tick-borne disease – which can have life-changing consequences – as a “travesty”. In response to parliamentary questions, he has been told the Scottish Government and Lyme Borreliosis Group will distribute branded tick removers to those at risk from the 5 per cent of ticks which carry the bacteria. These will highlight web links to public health information on the NHS Inform site. Mr Burnett has welcomed the move as a “good start” to the campaign to increase public awareness of a growing number of cases in Scotland, particularly in the Highlands and Islands. His comments refer to the work carried out in England and Wales where an interactive map records geographical areas where the instances of the parasite are high – at present a similar map for Scotland doesn’t exist. Mr Burnett said: ““We know the number of cases is growing because the ticks are surviving longer as global temperatures rise. “The Highland region is now a particular hotspot. Holyrood’s petitions committee is considering a petition lodged by Montrose woman Lorraine Murray and fellow sufferer Janey Cringean. Mrs Murray has been left virtually housebound since being bitten by a tick in August 2014 while walking her dog. The women called on the Scottish Parliament to urge the Scottish Government to improve testing and treatment for Lyme Disease and associated tick-borne diseases by ensuring that medical professionals in Scotland are fully equipped to deal with the complexity of tick-borne infections. Three islands became a particular focus for medics and researchers last year when it was found that, while neighbouring islands were recording single figure cases of Lyme disease, they had recorded 165. Over four years the islands of North and South Uist and Benbecula had the highest numbers of Lyme disease cases per head of population – to combat it, NHS Western Isles held a symposium on the islands in 2018. Held in Benbecula ministerial and medical colleagues discussed using social media, community pharmacies and production of educational materials to reduce the number of cases. Flu-like symptoms and fatigue are often the first noticeable signs of infection. An untreated bite often shows as a distinctive red circle-like mark on a person’s skin. Diagnosed cases of Lyme disease can be treated with antibiotics, but, if left untreated, neurological problems and joint pain can develop months or years later. Ticks are small arthropods related to spiders, mites and scorpions and Britain has a number of different species. People are most likely to come across sheep ticks, which feed on mammals such as deer and also birds, in open spaces with long grass or bracken. Last year it was suggested that over four years a total of 165 individuals on North Uist, South Uist and Benbecula were diagnosed with the disease. In that same period, Lewis and Harris have recorded just one case and Barra three. The figures for incidence of Lyme disease on the Western Isles were provided by medical practices across the islands.